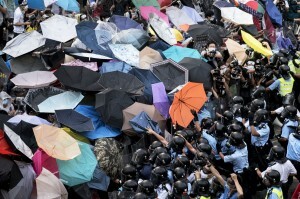 Michelle Chen, The Nation, October 1, 2014– The umbrella is a perfect icon for Hong Kong’s uprising: inclusive, aloof, a bit Anglophone and pragmatically defiant of the elements (and according to cinematic lore, readily convertible to a lethal kung fu weapon). It embodies the central plea of the protesters amassed in “Democracy Square”: a civilized demand for self-determination. Yet the biggest worry in Beijing right now isn’t the threat of universal suffrage, but what comes afterward—the struggle for social justice that Hong Kongers face they pivot between post-colonial limbo and authoritarian capitalism. The immediate spark for the protests was the controversy over the electoral process. Activists were incensed that following Beijing’s decree via the proxy authority National People’s Congress, candidates for Hong Kong’s 2017 executive election would be pre-approved by the mainland authorities. But even prior to the electoral betrayal, students revolted against the imposition of Beijing-controlled nationalist curricula on public schools. Longtime residents chafed at mainlanders’ perceived aggressive economic encroachment on local neighborhoods and businesses. And even the symbols of the protest express a yearning for a change in the social and cultural reality, rather than just liberalizing political mechanics. Like the “Hands Up” iconography of the Ferguson protests, the sea of umbrellas exude both civility and defiance in the face of brutality, not looking for trouble, just demanding dignity. It is true that even a genuinely democratic system may not be able to bring immediate improvements to grassroots and workers’ livelihoods. However, the current political system and the NPC’s ruling are flagrant violations of our political rights as well as our right to be heard. A pseudo-democratic system will only install even more obstacles on our already difficult path to better livelihoods and a progressive society. As Eli Friedman points out, Hong Kong is both an amazingly sophisticated and intensely unequal economy, compared to other “developed” nations. One-fifth of the population lives in poverty. The minimum wage, just recently implemented at the rate of US $3.60, hardly offsets the astronomical costs of housing, inflation and unemployment. The former colonial trade hub has lost some 80 percent of its manufacturing jobs as industries have shifted to the mainland. The most impoverished are often migrant laborers, youths and women. The radicals at the core of #OccupyCentral represent twentysomethings who are tired of the volatility of the economy and the stagnation of the country’s political system.